Former Scotland striker Billy Dodds says he was taken aback by the "toxic" atmosphere as Alex McLeish's side beat San Marino 2-0 in Euro 2020 qualifying. The 3,000 travelling support booed McLeish and chanted "sack the board" at the Scottish Football Association. And Dodds believes McLeish must beat Cyprus in the next qualifying match at Hampden in June to save his job. "It was a horrible atmosphere and I have not experienced that at international level before," he said. "I've had a bit of stick. We have all had disappointing results with Scotland, but it was toxic, it really was. "I'm just glad we got the second goal because if it had stayed 1-0, I don't think they would have accepted it as well as they did." 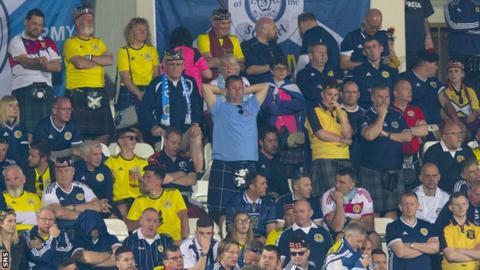 Dodds also claimed McLeish was in "shock" after Thursday's 3-0 loss to Kazakhstan. "I spoke to Alex for a couple of minutes after the press conference on Saturday and you could see he was just like 'Get me out of here, get me on that training pitch' and the players were like that," he said. "That's the kind of mentality it's been since the Kazakhstan defeat. "The second goal will give Alex the chance to rectify it against Cyprus. Anything against Cyprus that doesn't go well, I'm sorry the big man won't stay and make the campaign." McLeish's former Aberdeen and Scotland team-mate Willie Miller says the manager deserves the next two games - at home to Cyprus and away to group favourites Belgium, who top the section with two wins. "It [the win over San Marino] is not going to quiet anything down whatsoever in terms of the manager's position, we know that for sure," he told BBC Scotland Sportsound. "But I still think he should be given time to get some of the players back. "He's got to see the next two games and try and get the results. "I still think they [the fans] are taking the Kazakhstan result so hard they're finding it difficult to support the team. It's a big uphill battle to bring the fans back onside." Neil McCann believes there is huge pressure on Scotland now to beat Cyprus at Hampden on 8 June. "There will be a swell of 'We better win today' when we play Cyprus and that will bring its own pressure," said the former Scotland midfielder. "And it's how we deal with it. "Our home fans are more expectant than the away support, and that is what we're going to have to handle at Hampden."